Rate this project Alexander Pyhalov has announced the release of a new version of OpenIndiana, an open source operating system which is a continuation of OpenSolaris. The new version, OpenIndiana 2018.04, features a rebuilt userland using version 6 of the GNU Compiler Collection. The GNOME 2 desktop has been removed in favour of MATE. The release announcement reads: "We have released a new OpenIndiana Hipster snapshot 2018.04. The noticeable changes: Userland software is rebuilt with GCC 6. KPTI was enabled to mitigate recent security issues in Intel CPUs. Support of GNOME 2 desktop was removed. Linked images now support zoneproxy service. MATE desktop applications are delivered as 64-bit-only. Upower support was integrated. IIIM was removed." Further information can be found in the project's release notes. The operating system is available in three editions: Graphical (GUI), Text and Minimal. Download (pkglist): OI-hipster-gui-20180427.iso (1,551MB, SHA256, signature), OI-hipster-text-20180427.iso (664MB, SHA256, signature), OI-hipster-minimal-20180427.iso (391MB, SHA256, signature). Alexander Pyhalov has announced the release of OpenIndiana 2018.10, a new snapshot of the project's open-source operating system built from the ashes of Oracle's defunct OpenSolaris. This version updates the MATE desktop and most other applications to newer versions and provides various improvements to the Illumos kernel: "We have released a new OpenIndiana 'Hipster' snapshot 2018.10. The noticeable changes: MATE desktop was updated to 1.20; Python 3.5 was added, a lot of Python modules are now delivered for 3.5 Python version in addition to 2.7 and 3.4; Image Packaging System (IPS) has received a lot of updates from OmniOS CE IPS and Solaris IPS; KVM zone brand now allows you to manage your KVM VMs as Illumos zones; several new compilers were added, including GCC 8 (with patches necessary to build Illumos) and Rust 1.29; many components were migrated to 64-bit only, most newly-added software defaults to 64-bit; due to recent security fixes compatibilty with some Solaris applications is broken, the most important one is VirtualBox." See the release announcement and the detailed release notes for further information. Download (pkglist): OI-hipster-gui-20181023.iso (1,586MB, SHA256, signature), OI-hipster-gui-20181023.usb (1,943MB, SHA256, signature). Text-only and minimal ISO and USB images are also available. OpenIndiana is an open source operating system based on the Illumos project and a member of the Solaris family. The project has released a new version, OpenIndiana 2017.10, which features updates to the display server and the MATE desktop environment. The new version also supports binary compatibility with Solaris 10u10. The release announcement reads: "We have released a new OpenIndiana Hipster snapshot 2017.10. The noticeable changes: Xorg server was updated to 1.19.5. MATE was updated to 1.18. Text installer now can perform basic OpenIndiana installation to existing ZFS pool (for example, in parallel to another OpenIndiana installation). Cluster suite was updated. ABI compatibility for Solaris 10u10 binaries was added. We've started to remove GNOME 2 applications and libraries. Be warned if (by some strange reason) you still haven't switched to MATE." Additional information can be found in the project's release notes. Download (pkglist): OI-hipster-gui-20171031.iso (1,504MB, SHA256, signature, torrent), OI-hipster-text-20171031.iso (688MB, SHA256, signature). OpenIndiana is an open source operating system based on Illumos which continues the tradition of OpenSolaris. The OpenIndiana project has published a new release, version 2017.04. The new version includes support for USB 3.0, the MATE 1.16 desktop and an updated Xorg server. "The most notable change for this snapshot is related to hardware support. OI now fully supports USB 3.0 devices. Intel video drivers were significantly improved by Gordon Ross. The list of supported hardware has significantly extended. Xorg was updated to 1.18.4 version, so if you use any third-party modules - they might need recompilation or update (notably, the VirtualBox Guest Additions). MATE was updated to 1.16 version. We started shipping GTK+3 applications. Several GNOME 2 applications, which don't have MATE analogs, were updated to GNOME 3 versions. A lot of end user applications are delivered now as 64-bit only." Additional information on OpenIndiana 2017.04 can be found in the project's release announcement and the more detailed release notes. Download (pkglist): OI-hipster-gui-20170502.iso (1,540MB, SHA256, signature, torrent), OI-hipster-text-20170502.iso (639MB, SHA256, signature, torrent). Alexander Pyhalov has announced the release of OpenIndiana 2016.10, an updated version of the UNIX operating system which evolved from the abandoned OpenSolaris project. The most notable changes are the switch from GNOME to MATE for the "GUI" edition, move from GRUB to the FreeBSD bootloader, and no more support for i386 architecture. From the release notes: "Hipster 2016.10 is here. This time we provide three types of pre-built images - GUI images with MATE, traditional server install images and minimal images which we stripped down to be small yet useful. The most notable change for users is migration to FreeBSD Loader. After installing new bits, upon the next beadm activate, the new loader will be installed instead of GRUB. This improvement allowed us to modify the text installer so that it can newly install the operating system on RAIDZ/mirror ZFS pools. Intel KMS (based on Oracle's version) was ported to OpenIndiana by Martin Bochnig. Current implementation has some rough edges and supports only 6th and 7th generation of Intel video adapters, but is clearly a giant step forward for desktop users." Download the "GUI" (with MATE 1.14) live DVD or USB image from here: OI-hipster-gui-20161030.iso (1,487MB, SHA256), OI-hipster-gui-20161030.usb (1,789MB, SHA256). Alexander Pyhalov has announced the release of OpenIndiana 2015.10, the latest update of the distribution originally forked from the now-defunct OpenSolaris operating system: "So, after half a year we have a new ISO image. We synced IPS with the Everycity version, which includes Oracle updates and fixes necessary for IPS to work on illumos. Two major changes from previous IPS shipped with OpenIndiana Hipster - now we have Python 2.7 IPS version (in addition to the Python 2.6 one) and the linked image is the default zone type now. IPS knows about the zones and enforces some restrictions - for example, now GZ's publisher list should be subset of NGS's publisher list. Also distribution constructor was updated to use Python 2.7. Other changes include some preparations to support non-GRUB boot loaders. The text installer now creates separate file system for /var. We also included the text installer in the GUI ISO images. The main issue with GUI installer is that it is written in C and there's no one supporting it. The text installer, written in Python, is easier to maintain, so it gets more attention." Read the rest of the release notes for further details. Download: OI-hipster-gui-20151003.iso (1,233MB, SHA256). Ken Mays has announced the availability of a new OpenIndiana release, "Hipster" 2015.03. The new version provides updates to the GNOME 2 desktop, Intel video drivers and system libraries. "First of all, most evident changes were made in desktop area. We've updated X.Org server and libraries, which allowed us to incorporate some important security fixes from Oracle x-s12-clone and Debian X.Org. Also we've moved much more closely to GNOME 2.32. Most packages were updated to this level, excluding packages which either have a lot of specific patches (like GDM) or just dropped some significant functionality (like Cheese, which dropped HAL support in version 2.32). Not everything has gone smoothly. We had to drop trusted desktop support during update. I believe nobody seriously used it under OI. The most annoying thing is that updated Xorg and Intel driver require some DRM updates, which are still not ready. So, if you have Intel video card, either pkg freeze X-incorporation and X.Org, or use vesa driver." Further information is available in the project's release notes. Download: OI-hipster-gui-20150330.iso (1,237MB, SHA256). 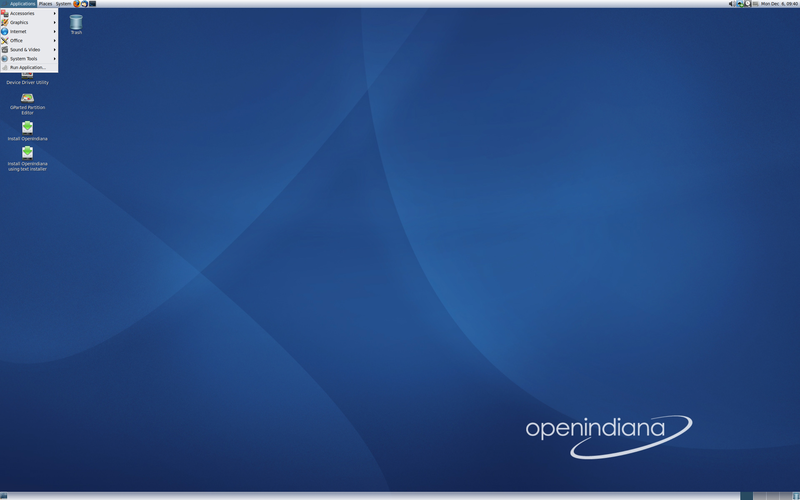 Jon Tibble has announced the release of OpenIndiana oi_151a8, a new pre-stable build of the operating system originally forked from OpenSolaris (after Oracle's decision to discontinue the project). From the release notes: "OpenIndiana oi_151a_prestable8 aka oi_151a8 is a bug and security fix release with some big version bumps and also the first rebuild of the JDS in the pre-stable series. This is an ISO release. This release has changes to ZFS and kernel/libc interactions that mean child zones will not work with global zones upgraded to a8 until they are brought in sync to a8 themselves. Other changes: bump Illumos to hg:14087:9919574e3322 git:7256a34efe; backout sgml util removal for now; include beta vmxnet3s driver; bump Apache to 2.2.25; bump Autoconf to 2.69; bump BIND to 9.6-ESV-R9-P1; bump OpenLDAP to 2.4.35; bump OpenSSL to 0.9.8y; bump PHP to 5.2.17; bump Samba to 3.5.21; bump Wireshark to 1.8.8...." Download from here: oi-dev-151a8-live-x86.iso (843MB, SHA256).